A few days ago, a passive-aggressive cutie-pie on Twitter did the old “Just asking questions” routine with me about my theory on who killed Ismail Bakr, Mohammed Bakr, Ahed Bakr, and Zakaria Bakr, said to have died on the beach at Gaza, July 16, 2014. This person ignored the screaming inconsistencies in the official story and asked me to explain minutiae. She was being deliberately obtuse, a power play used by deeply angry people. When I began mocking her, she called me a chauvinist, since of course being repelled by one woman means that I hate all women. 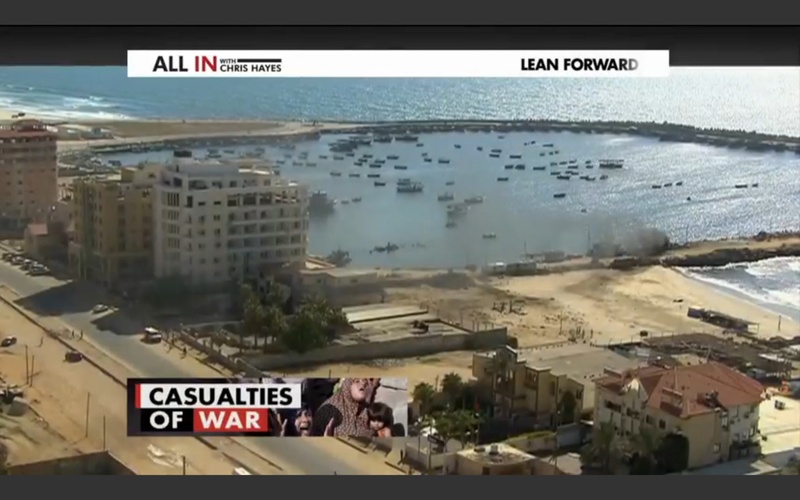 But to illustrate how I know I’m right, I’ll show you an example of Hamas fraudulence that can’t be explained away. First, I’ve been assured that I can reveal that I bought all the film from all the Palestinian cameramen who were on the beach at Gaza on July 16, 2014. Nobody’s lives will be endangered. Looking at the film has confirmed every theory I had. I’m now 100 percent confident that I know what really happened. This DOES NOT mean that I’m saying that the Israeli Military Advocate General (MAG) Corps was wrong when it determined that the IDF accidentally killed the four boys. The MAG Corps had access to videos from unmanned aerial vehicles (UAVs). They also interviewed every member of the IDF involved. All I’m saying is that I’ve reached a different conclusion, based on what I’ve looked at. The MAG Corps was tasked with determining the legality of IDF actions. I, however, wanted to determine the actions of Hamas and the press, since I felt I already knew the actions of the IDF. It’s not surprising that the MAG Corps and I came to different conclusions. But I won’t ever say that the MAG Corps is wrong. Instead, I’ll just give you the evidence that supports my theory: Hamas murdered Ismail, Mohammed, Ahed, and Zakaria Bakr in order to blame it on the IDF. One thing the film I bought shows is that Ismail, Ahed, and Zakaria Bakr had their midsections deboned. Their pelvises were removed. Ismail Bakr was folded in half and placed under metal debris in the Hamas naval compound on the breakwater. Since he was dead and covered, his body gave off no heat signature that the Israeli UAVs could see. I wondered why the children were so terribly mutilated. Why were their bones removed? And then answer came to me. They were deboned so that they could be folded up and carried to the beach in backpacks. The film I have shows little boys who appear to have been partially dissected. When laid out on the sand or on stretchers, they look relatively intact. But their legs are attached to their trunks by sinew, nothing more. They have no bones in their midsections. And yet these mutilations didn’t bleed. Mohammed Bakr—the boy in the green shirt—wasn’t mutilated. He had four round holes in his chest; that’s all. It could be that he was chosen to be the poster boy, so they wanted him photogenic and easy to carry. Or it could be that different Hamas terrorists were assigned to each boy, and the one who murdered Mohammed was able to get him to the beach without having to debone him. I haven’t decided if I’ll put the video of the boys’ horrific injuries in my movie. Simply telling you about it may be enough. The rushes I bought show that every single action carried out by the paramedics was repeated multiple times. Everything was staged. First watch this video, which I can’t embed. 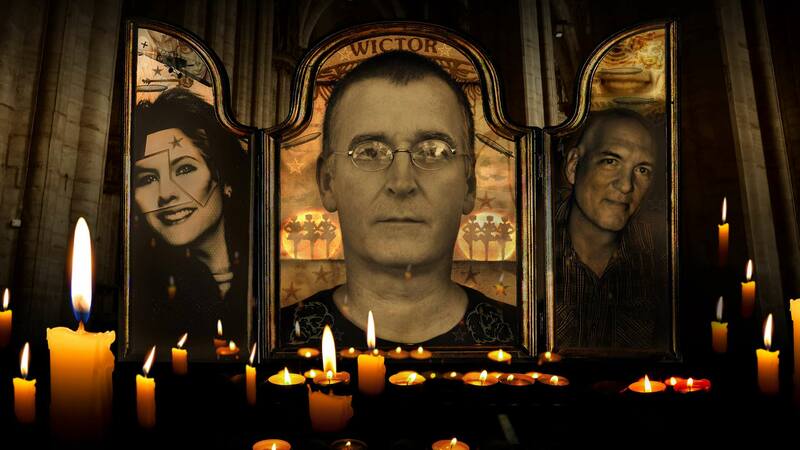 Now, watch the first fourteen seconds of this video. Both videos show the ambulance that was parked on the corner of the Avenue Restaurant and Coffee Shop. Did you notice that even though the paramedics run to the ambulance and begin driving it down the street, the medical personnel and the crowd are totally different in both videos? 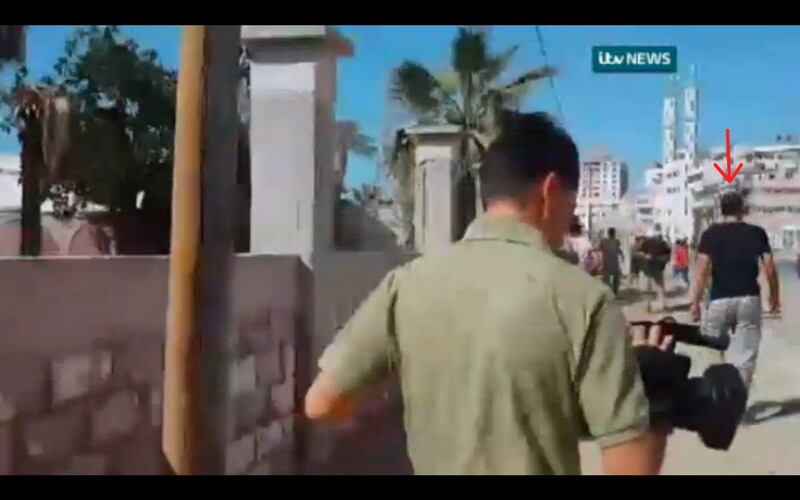 In the ITV video, the paramedic with the stretcher (red arrow) is followed by a man in a yellow shirt (green arrow). 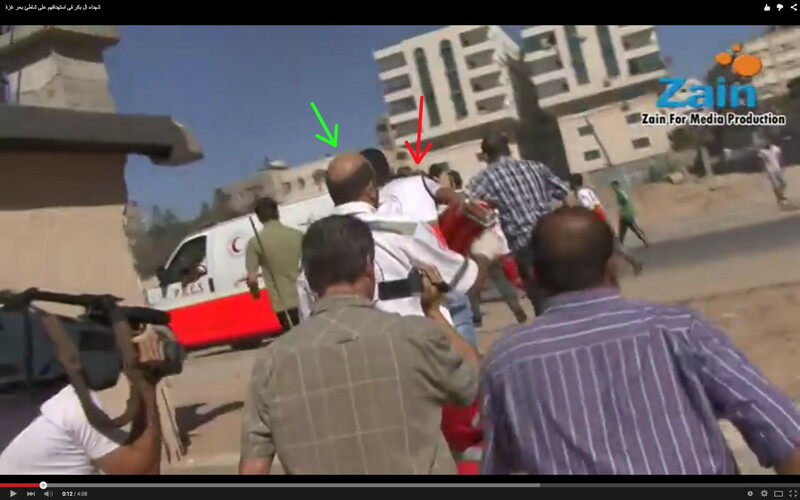 In the Zain for Media Production video, the paramedic with the stretcher (red arrow) is followed by a bald paramedic (green arrow). In the ITV video, the paramedic carries the stretcher on his shoulder, while in the Zain video he holds it on his hip. Back to the ITV video. 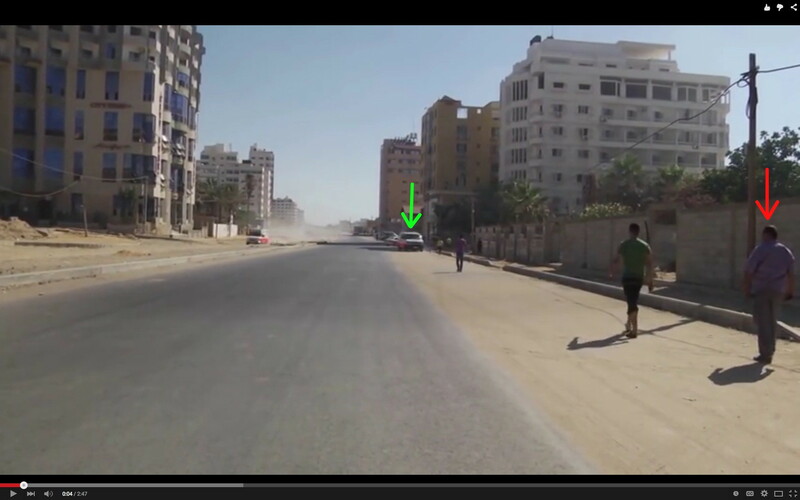 This paramedic (red arrow) doesn’t appear in the Zain video. 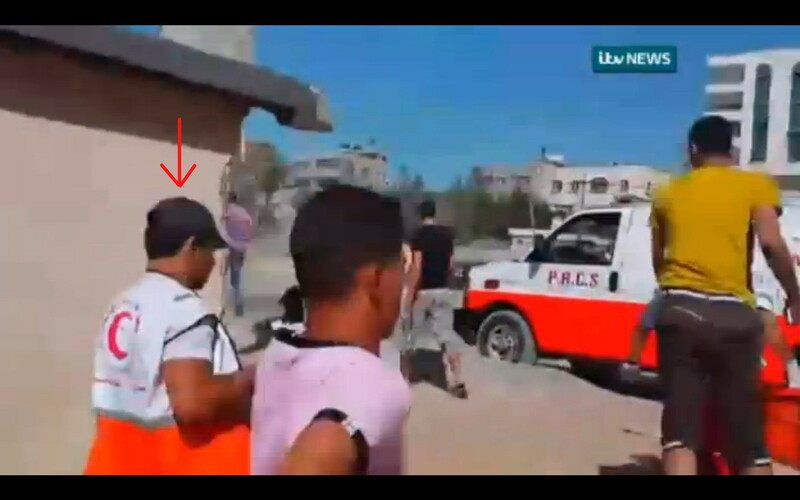 In the rushes I bought, you can see the Hamas commander in the purple shirt (red arrow) standing by the empty lot, waiting for the ambulance (green arrow) to arrive. 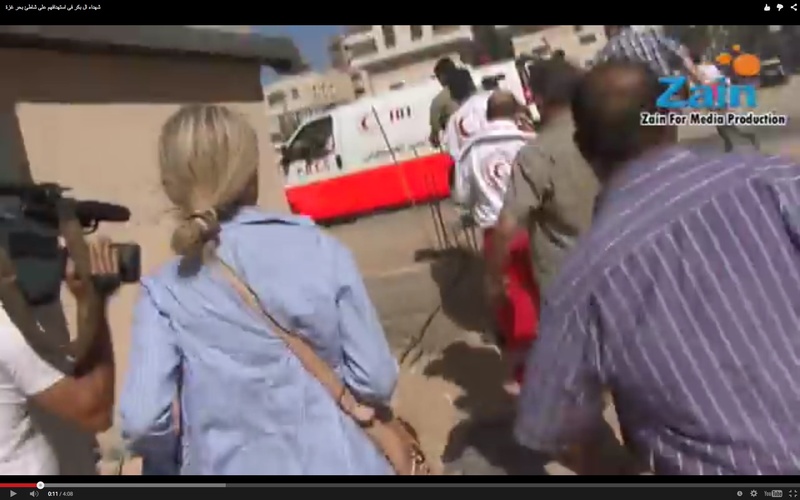 The Zain video, on the other hand, shows the commander accompanying the ambulance to the empty lot. Studying the rushes allowed me to see what I’d missed before, that the driving of the ambulance from the corner of the Avenue Restaurant and Coffee Shop was staged. It was filmed multiple times. 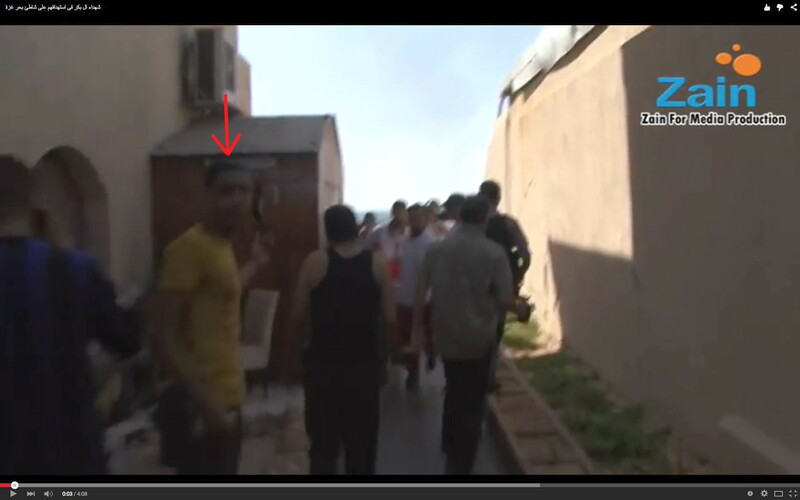 The Zain video shows the man in the yellow shirt (red arrow) guiding the paramedics back from the beach behind the al-Andalus Wedding Hall and Restaurant. The paramedics had arrived too early, so they were directed to park at the corner of the Avenue Restaurant and Coffee Shop and wait. I thought that the most likely reason the paramedics were ordered back from the beach was that a Hamas bomber had accidentally blown himself up, and his colleagues were collecting his body parts. I was right. The rushes show a torso wearing body armor with a radio on the back. The head, arms, and pants have been blown off. 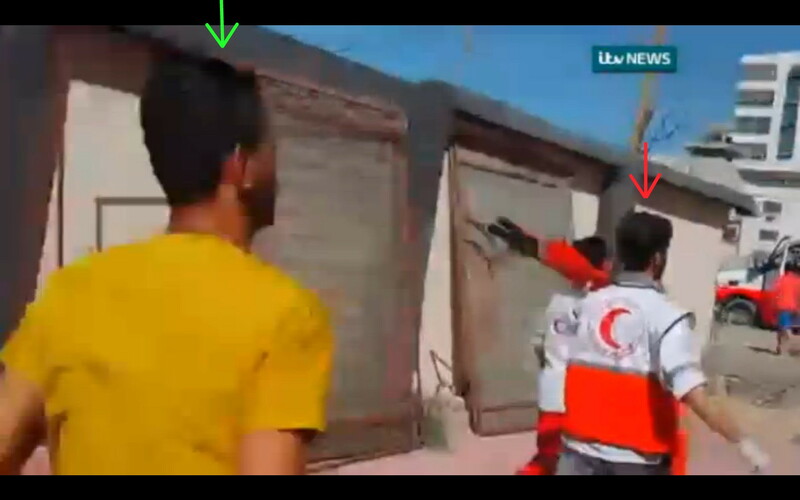 One clip shows only the torso, and another shows the helmeted head beside the torso. The dead bomber was lying next to Ahed Bakr, which is why Hamas didn’t allow close, clear film or photographs of the scene. In the rushes, the bomber is visible for only one second in total, but it’s clear that he’s there. He was edited out of almost all video released. One video of the scene missed the dead bomber. It’s posted on YouTube. I’m not going to identify it, in case they re-edit it. The video was edited twice after my posts. This time we’ll see what happens if I don’t give them help in concealing this crime. The ITV footage shows the actual moving of the ambulance that later received the body of Mohammed Bakr. Zain For Media Production published one of the many takes that somebody didn’t like. Look at this man (red arrow) in the ITV footage. He’s “muscle,” a merciless Hamas killer there to keep everyone in line. He walks with his fists clenched, a person of hideous physical and psychological power. Remember: The Gazans are being held prisoner by Palestinian terrorists. Gazans have much for which they must answer, but they’re still hostages. If so, where’s the morality? This article viewed 1524 times.